A high-performance adhesive that exceeds silicones, acrylics and rubber cements. 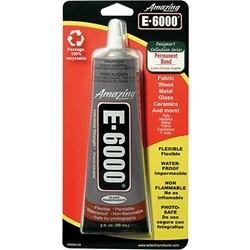 E-6000 bonds to a wide range of materials including, metals, glass, plastic, cement, leather, wood, etc. It creates a tough waterproof bond that won t crack or become brittle but remains flexible.